Are you looking for a loyal and true best friend, never too busy to cuddle? 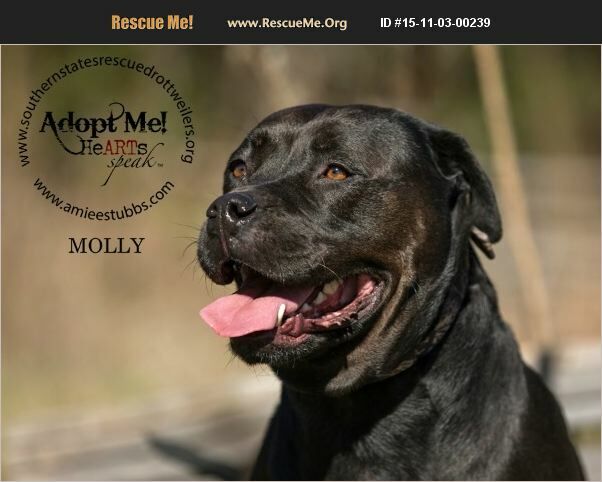 Meet Molly; a 6 yr. old female Rottweiler Mix who was abandoned at an animal shelter near Winston Salem, NC. Molly had been severely neglected; in addition to being sick with various illnesses, she was emaciated and heartworm positive. Molly's time was up that day. Her condition and appearance made her unadoptable, and the shelter was out of room; sadly, she found herself first on 'The List.' Molly was only hours from being euthanized when SSRR rescued her. Life has changed for this very sweet, loving girl. Molly loves being taken care of by her Foster Dad. He plays fetch with her, and she gets lots of love and attention. Her favorite position is cuddling while they watch ball games together... and she never talks during the kickoff or important plays!! Molly just loves hanging out with her human! Molly is a survivor! She has been treated for heartworms, spayed, and is now healthy and ready for her forever home and family. She is house-trained and crate trained, and walks well on a leash. Molly has been through so much at the hands of those she had trusted to take care of her; yet, she is very friendly to everyone and loves to give kisses. Despite her past, Molly still loves people and wants her very own family. This sweetheart will melt your heart the moment you meet her. If you want unconditional love, this little lady is your match. Molly does well with children and male dogs (when introduced slowly); no cats. A fenced yard is a requirement; no underground fencing.